I'm going to say something controversial here: I don't like Dark Souls. That doesn't mean I don't appreciate it, but it's always been from afar, through my colleagues' write-ups or fan-made YouTube videos (like that one guy who beat it using only a guitar controller, holy crap). I forced myself to finish Souls-y spinoff Bloodborne, not because I wanted to, but because I felt like it was a matter of personal pride if I didn't. Dark Souls and games of its ilk make me feel physically ill when I play. They demand so much of my awareness and reflexes at all times, and their stakes are so high, that each time I leave a bonfire, it's like I'm inhaling a big gulp of air and holding my breath until I make it to the next one - which can often take up to an hour, depending on what I'm trying to do. A constant pit grows in my stomach, a wrenching feeling that gets stronger and heavier with each enemy I defeat and each soul I claim. I get that people enjoy that, but that feeling is not why I come to video games. I started playing Thumper a few weeks ago, the so-called 'rhythm violence' game designed by a small team of ex-Harmonix developers, and I noticed I was getting many of the same feelings I got when I played Bloodborne. Thumper takes place in this strange nightmarish hellscape, its music an industrial mix of polyrhythmic drums, brass, and synthesizers. It starts out fairly easy, but the deeper in you get, the faster and more relentless it becomes, forcing you to give it 100% of your attention as you time your button presses and analog stick swipes to navigate a gauntlet of banked turns and barricades. I found myself entranced by its demanding rhythm, even coming to enjoy the quickening pace of my heartbeat which gives rise to a tense, ill feeling in the pit of my stomach. It happened. I finally got it. Thumper is my Dark Souls. I admit it's a huge cliche to say that 'X Game is the Dark Souls of Y', and that's because that comparison is usually made when a game is either incredibly difficult, or uses much of the same combat vocabulary. Things like deliberate animation cycles and sword strikes, soul-crushing challenge, losing progress if you die before you bank your earned experience or currency - these are things which Dark Souls brought to the forefront of game design, and many big-budget and independent developers have taken many of these designs to heart in making their own games. On paper, Thumper couldn't be further from Dark Souls. You're a silver beetle, racing headfirst down a track, and Thumper's roots in games like Guitar Hero and Rock Band are displayed proudly on its sleeve. It's a rhythm game at heart, requiring precise timing along with the music to succeed, and checkpoints are incredibly plentiful. And yet it's one of the most harrowing yet satisfying games I've ever played, and the feeling I get from it has similar echoes to the things that all my friends say about From Software's masterpieces. Like Lordran of Dark Souls or Bloodborne's Yharnam, Thumper's atmosphere is thick and oppressive, like smothering yourself in a blanket made of demons. Unlike those games, Thumper revels in abstraction. Its spindly, undulating tentacles stretching along its neon and chrome race track look like a Yes album cover drenched in an almost Satanic kind of evil, but outside of these small concrete details, the rest is sort of an unformed mass of deep reds and dark blues. Even its gameplay is stripped down to core essentials - all you need to worry about is tapping or holding the X button and moving the analog stick to turn down the track or hop over spikes. Even with this deconstruction, Thumper follows the Souls-ian formula almost perfectly. Dark Souls games are all about learning through failure, of repeatedly beating you down to get you to learn things like proper timing, when to block, what items and weapons to use in a given situation, and so on. Its difficulty starts where most action games end, and continues to find new ways to challenge you, rarely giving you a moment to rest while constantly pushing you to your limits. You will feel like the things it tries to get you to do are impossible, until suddenly, they're not. You then feel like a champion, only to be utterly demolished by whatever tower-sized monster it throws at you next. Thumper, then, is this Dark Souls loop of failure, learning, and success in microcosm, repeated hundreds of times over the course of its nine levels. Thumper begins at 60 miles-per-hour and only gets faster from there, teaching you how to maneuver through its handful of obstacles and then throwing them at you at a blistering pace. It's so ridiculously fast and relentless that you'll begin to notice how every single ounce of your concentration will fixate on the screen. To outside observers, the things you will have to do look impossible - to you, well, once you get it down, you're just reacting. There's a constant wave of tension and release, not only within each stage as a whole, but within each section as well. Each segment can last a handful of minutes, and you have to navigate corners, lasers, and more with precision - two hits, and it's back to the start of the section with you. While the punishment for failure is nowhere near Dark Souls' gut-wrenching moments where you lose 50,000 souls in an instant, these sections are so tricky and just long enough to feel uncomfortable that you'll often find yourself praying for the checkpoint to just get here, now, now goddammit, why isn't it here yet? Failure sets you back to the beginning of that section, but now you've got a better idea of what's coming. You're prepared. You pass through the gate, your silver scarab healed for the next run. You're given a tiny moment where you can breathe for a bit. Collect yourself. And now you're back in it. Tap. Tap. Hold. Turn. Turnturnturn. Again. Again. Over and over. Ride the wave. Let pure instinct take over. Don't think, don't worry, just act. Checkpoint. The wave crests, and begins again. Things you never thought you'd be able to do - tap, leap up, change lanes, slam down, bank turn left, all within the span of about two seconds - are, after constant trial and error, second nature. 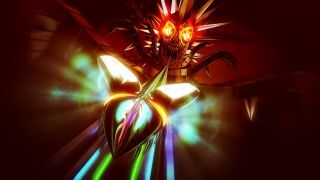 But Thumper is never without its surprises, constantly throwing curve balls right up until its time-melting finale. Thumper gives me that same rush that Dark Souls has provided so many people, but by breaking that physical thrill into smaller, more manageable chunks, it becomes less of a chore and more like a roller coaster that I want to get right back on as soon as it ends. Some people finish Dark Souls and start right back up on a New Game+; I'm going back into old Thumper levels to better my score, and to check out the new Play+ mode, which makes the action faster (faster) as you play more accurately. It's easily one of my favorite games of the year, and I'm going to gush about it in the same way people talk about the deep gameplay and intoxicating atmosphere of Dark Souls for quite some time.